A couple of years ago, I won a GoPro Hero4 Silver in a photo contest for my capture of the Breitling Jet Team at the Fort Worth Alliance Air Show. (Thanks, Fort Worth Camera!) I began to imagine how I would look with my new action camera mounted to my helmet while I documented my exciting travel adventures. But...I don’t snow board, or paddle board, or jump out of airplanes (or even own a helmet). What exactly was I going to use it for? I had no idea but I dutifully packed it in my camera bag for my next trip. Months later, my daughter asked me if I had used the GoPro yet. A bit ashamed, I shook my head no. But in my defense, it’s not a serious camera. Right?? 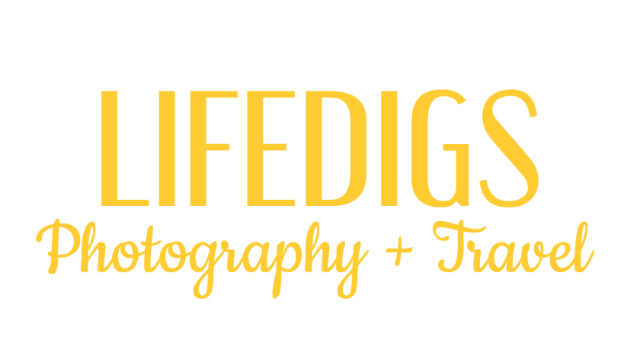 Professional photographers don’t use it to capture quality images. Right?? I already had an amazing DSLR (that also takes video) with a bag full of lenses. If I didn't use my REAL gear I could risk missing a great shot! But the truth was, I was already missing shots by NOT using my GoPro. Travel photography can be exhausting, especially when you are a one-(wo)man show. Lugging gear, changing lenses, swapping batteries and filters back and forth, driving for hours and dealing with extreme weather conditions will eventually take its toll. There have been times, I admit, that I chose to leave my gear in the room because I was physically & mentally spent. Without fail, I would get to an amazing spot, empty handed and kick myself. A hand full of times, I have chosen not to carry my gear because I was skeptical of my surroundings. Bringing attention to myself with my bulky and expensive camera was the last thing I wanted. The GoPro camera is so small and convenient that it can fit in my shirt/jacket pocket. No matter how exhausted I am, it would require little effort to pull the camera out and snap a pic. I just had to bring myself to do it. 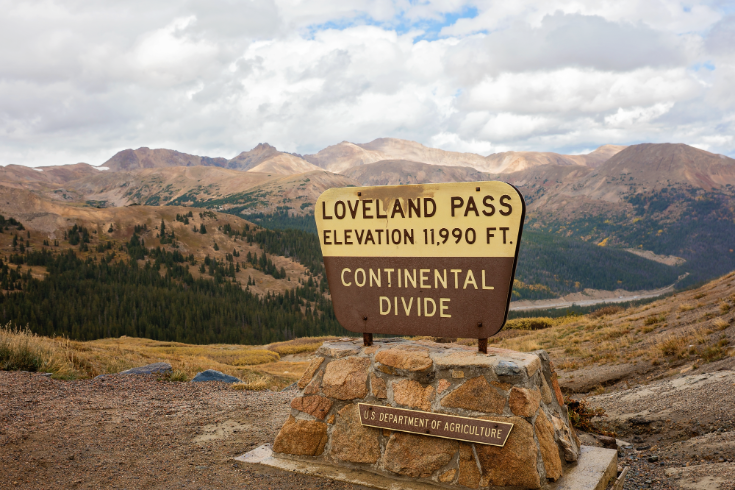 My favorite thing to do when I’m in the Rocky Mountains of Colorado is drive up to Loveland Pass. 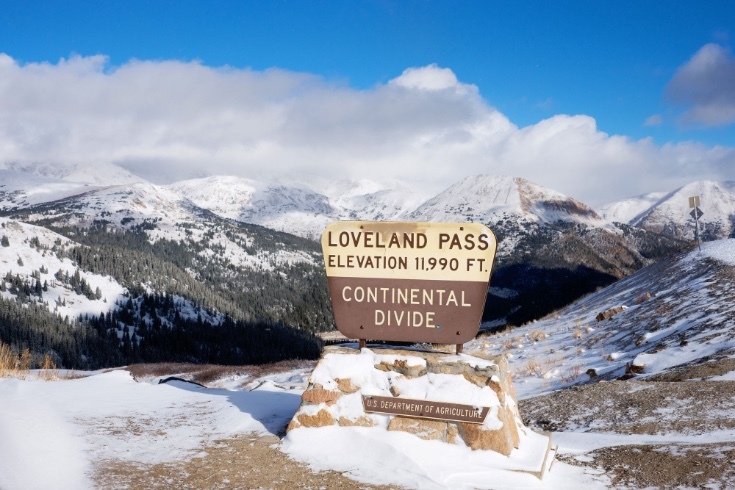 At almost 12,000 ft elevation, it’s one of the highest mountain passes in the world that stays open in snowy weather. The steep drive with scary hair-pin turns has some of the most fantastic views I’ve ever seen in my life. The scenery is unobstructed by pesky guard rails because who needs those anyway?? When I went in September, it was fairly late in the afternoon before I got to the pass. Having been traveling mountain roads since 5am that morning, brain fatigue had set in. At one of the switchbacks, I pulled over to take a photo of the expansive valley below. What I didn’t know was, a sneaky snow storm was coming over the mountain. As I was standing close to the edge, an enormous wind came behind me and threw me forward. (I think it actually picked me up off the ground a tiny bit). I had never experienced a wind that strong and it scared the hell out of me. Just what kind of weather system was about to happen? Ok, note to self: don’t stand so close to the edge of a sheer drop. When I reached the summit, the sky was divided between a beautiful clear blue and ominous darkness. I knew I needed to take my photos and get down to the other side or I would be dealing with slippery roads and restricted visibility on top of my exhaustion. Loveland Pass is a nail biter on a good day. Flustered, I wasn't sure I had time to set up my equipment and considered moving on without taking any photos. Most people at this point would have settled on taking photos with their iPhones. For me, however, low resolution photos are useless. That's about the time the GoPro sitting on the console caught my attention. It was like I could hear it say "Put me in, Coach!" Without another thought, I grabbed it and flung open the car door. Having good images of the valley already, I was particularly interested in shots of Pass Lake with some interesting vantage points. Fighting the icy wind, I got close to the ground at the water line and put my little action camera to work. Quickly I was able to get the shots I wanted which allowed me time to explore a couple of other spots at the summit. Soon I was back in the car and off the mountain before the first snow flake hit the ground. When I got back to my Airbnb and uploaded the images I was pretty impressed. The ultra wide angle lens allowed me to get up close to some of the scenery while pulling the rest of the background into the image. They looked other worldly and I loved them. Right then I made the decision that my GoPro was my new go-to camera for “Let’s do this and get the hell out of here” photos. TIP: The GoPro has a limited battery life. Keep it plugged into your car charger or power bank so it is ready to go! Newer models can be used with the GoPro Dual Battery and Charger. Like most camera batteries, extreme cold temperatures can decrease battery life. Keep the camera and batteries in a warm place prior to use. GoPros are rugged and when used with the waterproof housing can go where your other cameras (and smartphones) cannot. Mine has certainly taken a beating! They are designed to be used by adventure seekers in all kinds of extreme circumstances. TIP: When using in humid or wet situations, pay attention to fog or smudges on the screen or housing. Keep a microfiber cloth in your pocket so your shot isn't ruined. The GoPro has remarkably good image quality, especially the newer HERO 5 or 6. So why not just use that instead of my DSLR? Nothing beats the capabilities of today's DSLRs when you need to print large and detailed images. That being said, the GoPro is still very good and miles better than anything a smartphone can do. Because I sell my landscape photos from my travels, the resolution of my images has to be high enough to print. The GoPro's resolution is certainly high enough for small to medium sized prints. There will probably be some loss of image quality with large prints. Sometimes I like to digitally "paint" my photos with software like Corel Painter. Subtle painting effects can conceal those quality imperfections. You can create impactful images with the fish eye lens of the GoPro by capturing all 180 degrees of the scene. But if you want a more traditional look, you can change the camera setting from wide to medium. 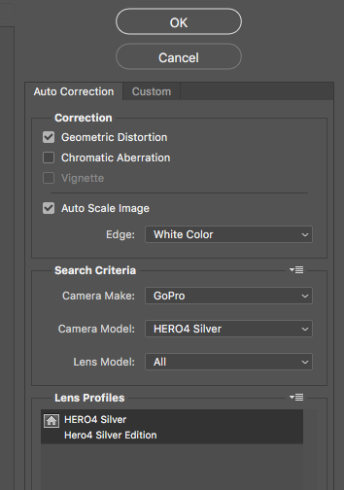 You can also change the perspective in Photoshop (Filter→Lens Correction). I do this a lot if I feel the image is too distorted. A wide angle can be impactful but it can also be distracting. Even with the newest versions of the GoPro Hero, images will usually need a bit of tweaking in editing software like Photoshop or Lightroom. If you are experienced with shooting in .arw (raw files) then you will be happy to know GoPro uses the comparable ProTune feature. This allows for greater control over the outcome of your image.